Home > Departments > Faculty > Janette T. Greenwood Ph.D. 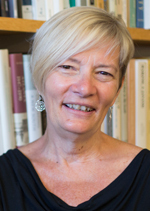 Professor Greenwood received an A.B. from Kenyon College in 1977, an M.A. from the University of Wisconsin, Madison, 1978 and a Ph.D. from the University of Virginia in 1991. She has been at Clark since 1991. She is affiliated with the programs in Women's and Gender Studies and Race and Ethnic Relations. Dr. Greenwood teaches a variety of courses in U.S. History including Race and Ethnicity in American History, History of the American South, Reconstruction, The Gilded Age, and Public History. She is the author of First Fruits of Freedom: The Migration of Former Slaves and Their Search for Equality in Worcester, Massachusetts, 1862-1900, 2010, Bittersweet Legacy: The Black and White "Better Classes" in Charlotte, (1994), and The Gilded Age: A History in Documents (2000). She is also co-author of an innovative U.S. History survey text, American Horizons: U.S. History in a Global Context (3rd edition, 2017). She is co-curator of Reimagining an American Community of Color: The portraits of William Bullard, 1897-1817, an exhibition at the Worcester Art Museum which opened in October 2017, and co-editor of the exhibition catalogue. American Horizons: U.S. History in a Global Context (with Michael Schaller, Robert Schulzinger, John BezIs-Selfa, Andrew Kirk, Sarah J. Purcell, and Aaron Sheehan-Dean). Oxford University Press, 2012. "Allen Parker and Worcester's Civil War Era Migration," The Worcester Review (Fall 2007). "Southern Black Migration and Community Building in the Era of the Civil War: Worcester County as a Case Study," in Faces of Community: Immigrant Massachusetts, 1840-2000, Massachusetts Historical Society, 2003. The Gilded Age: A History in Documents, Pages From History Series, Oxford University Press (August, 2000). Paperback edition published 2003. Bittersweet Legacy: The Black and White "Better Classes" in Charlotte, North Carolina, 1850-1910, University of North Carolina Press, 1994.